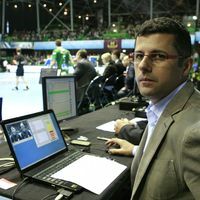 The EHF introduced a new service for coaches, referees and delegates at the EHF Cup Finals in Nantes on 18/19 May 2013 with the first full implementation of the new digital scoresheet. Developed in conjunction with the FIBA Europe Techno Centre, the system was developed initially for basketball, and has been further developed specifically for handball. Following a successful test of the system at the Women’s EHF European Championship in Serbia in December 2012, the system was been made fully available for coaches and technical offices at the EHF Cup Finals for the first time. Directly after each game the digital scoresheet is made available on a USB stick at the post-match press conference. The system is based on the existing match scoresheet, but allows the users to click on particular incidents during the game, including goals, penalties, yellow cards and 2-minute suspensions. The EHF is planning to roll out the digital scoresheet at the next EHF European Championship in Denmark in January 2014.